Jonas's first birthday is six days away. My son is turning one. Months ago, uttering the words "my son" seemed foreign to me. Like they belonged to someone else, and I was just observing. But now, as his birthday is rapidly approaching, they couldn't feel more natural or right. After sorting through photos of him from when he was first born, I can't believe how tiny he was. He's been such a little big person for what seems like so long now, I'm already starting to forget just how small he was when he first came into this huge world. A year is a short time, and a long time all at once. When you're a parent, a year is an instant and an eternity wrapped into one. Several days ago, I placed Jonas on the living room floor to play, and yearned for a time when I could just plop him down in one spot and he would be content to just lay there, staring at his hands and feet for hours. 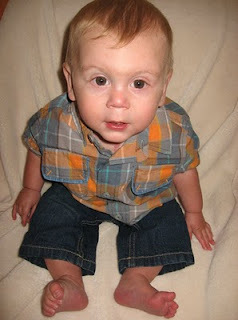 Now he is a little boy, speaking words and full of expressions that belie someone much older than his one year of life. He tentatively lets go of one of my hands first, then the other; carefully taking a step or two on his own before deciding that crawling is still faster. He will still need me for many things for many years to come. He will grow to need me in different ways as each year passes. To me, he will always be my sweet boy, full of sunshine and strength. But as he toddles toward independence, he is one step further from mommy's protective arms, and one step closer to becoming everything I hope he can and will be on his own. There have already been lots of adventures in this first year. We've seen and done so many things, and been so many places. There are things to look forward to every day that will make this year better than the last. We will struggle and cry, we will celebrate and triumph. Seeing things from Jonas's size has made me believe in love and life as I never have before. Thank you, little buddy, for being exactly who you are: PERFECT. The first week in December, my mom and dad came to visit us and spend some time with their new grandson. We had lots of fun, but Jonas's breathing started to become labored again, and it was clear to me by the end of the weekend that we needed to take him to Miami Children's Hospital once again. I drove him down to the hospital around 11:00a.m. on Sunday the 5th. We spent the better part of the day in the Emergency room, before finally being admitted. Kris was working all day, but his mom came to hang out with us in the hospital room. Jonas was getting very sick, he was more fussy than I'd ever seen him. He always has such a happy disposition, but you could tell he was extremely uncomfortable. By late Tuesday, it was determined that he needed the second step in his three step heart repair. And so, we started to mentally and emotionally prepare for it again. He was taken in for the procedure on December 8th: His four month birthday. We spent the day in the waiting room, biding time on Facebook and watching television as we waited for the next update. Strangely enough, as I scanned the news on Facebook, I discovered River Cuomo (The lead singer of Weezer, Jonas's namesake band) had been in a bad bus crash while on tour. He was in the hospital recovering at the same time Jonas was having his surgery. An odd coincidence, indeed. I was pretty confident in Jonas's ability to recover quickly. He bounced back rather fast after the first surgery. The doctors also suggested that the recovery time on this procedure was shorter than the first for most babies. Unfortunately, this one was not to be as easy. Post-surgery, Jonas had fluid on his lungs. A new incision had to be made, under his left armpit, to drain some of the fluid. He was set back in recovery a few days from this, and we spent a long weekend wondering when he would start to improve. Days crept closer to Christmas, and all I could think was that we'd be spending the first Christmas with our newborn son in a hospital. He was having a hard time tolerating formula post-surgery. He had to be fed intravenously for a long time, and then transitioned back to pedialyte, which he absolutely hates. Finally, formula was re-introduced, and he was able to keep it down. We counted down the days, making predictions as to when we'd be able to take Jonas home again. On December 17th, we were given the walking papers, and got our boy ready to come home once again! It would most certainly be wonderful to spend our first Christmas at home together as a family! It was relatively smooth sailing for a little more than a month. We brought Jonas home, eased our way into parenthood, relishing the sweet moments and groaning over the rough ones. Just like any other parents since the beginning of life. 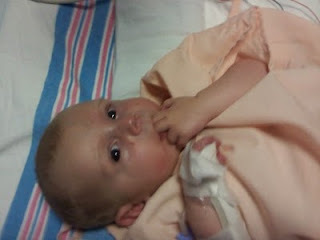 I've often said, in hindsight, that I didn't really realize how poor Jonas's health was until after his second surgery. We didn't have anything to measure it against, and we were just trying to take it one day at a time. He seemed ok, or as ok as he could be. He slept a lot, but I thought that was normal for a baby to do. I would really only worry if he slept for the better portion of a day and night, but even then I just let him rest. I think it's probably a good thing he is my first child, as I didn't know what was "normal". One day in early October, we brought Jonas back to Miami Children's Hospital. It was just supposed to be a regular checkup, to assess his health and progress, and schedule a date for a catheterization. After an EKG and an echocardiogram, it was determined that Jonas needed to be admitted for further testing, including an emergency catheterization. The concern was that, due to the results of his preliminary tests, his heart was not functioning well enough to support the rest of his body functions. That night, Kris and I slept next to Jonas's bed. At 6:00a.m., nurses came in to prep him for his procedure. They took him away around 7:00, and we went downstairs to have breakfast and await the results of the procedure. A couple of hours later, he was returned to his room. 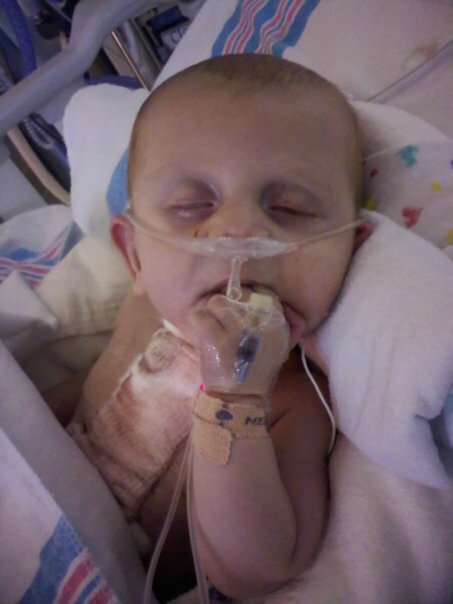 His breathing tube was removed, but he was having difficulties breathing on his own. He was greyish-blue, and several doctors and nurses crowded around him and quickly placed an oxygen mask on his face. As for the catheterization, the results did not show anything abnormal. Doctors told us that his heart function was weak and decreased, but this was to be expected prior to his second surgery. He stayed at MCH for another day or two, to recover from his procedure and to have his health monitored. He seemed to be doing well enough to come home, and so once again we were discharged. In the months that followed, I would get this sinking unsettling feeling just before I knew we were going to have to return to MCH again. There was one more time about a week or two later that we were readmitted for an overnight stay. Jonas was vomiting and his breathing was labored. All symptoms that we're supposed to take him to the hospital for immediately. August 22nd, 2009: Jonas's Homecoming! There had been whispers for days from doctors and nurses that Saturday we would get to take Jonas home for the first time. He'd been improving rapidly every day, and we'd hear "that puts you one step closer to the door". We watched an infant CPR video in preparation to take him home. We began slowly packing our belongings both at Devonshire and in our hospital room, and waited for the final word that would come when the doctors made their daily rounds. When we received the good news that we could finally take our baby home, we were so excited! Finally, the day we'd been waiting so long for. We received instructions on all of the medicines we had to administer, and packed up a pulse oximeter to monitor the level of oxygen in his blood. We were also sent home with a baby scale to keep track of his weight. We dressed Jonas in his going home outfit, packed him in his carseat, and headed for the door. As we pushed his stroller through the main entrance of MCH, I cried tears of joy. I turned to Kris, and quipped with him that we'd better get going fast, before anyone changed their minds and decided to make him stay longer! On the ride home from the hospital, sleeping soundly. We arrived to a big welcome home sign, balloons, streamers, and a sigh of relief. In the days and weeks that followed, I never complained about having to wake up with him in the middle of the night. I was so happy, so completely blissful that he was home, that it didn't phase me one bit. Kris and I fell into the groove without much effort, like we'd been doing it all along. Kris and I spent most of the day, every day at the hospital. I was still on maternity leave, but he went back to both work and school. Sometimes he would drive from Coral Gables to Fort Lauderdale for school, and I would ride back with him to spend a few hours in our home. We were staying at Devonshire Apartments, which Miami Children's Hospital owns and rents out to families with children in their care for a very low cost. It was strange leaving Jonas every night. Most parents aren't separated from their children overnight for months, sometimes years, after they are born. But we didn't have a choice. We had to rest, and being cooped up in a hospital eating three meals a day there gets really old rather quickly. On the bright side, Jonas was making progress. Every day or two, the doctors would make their rounds and decide what would happen next. One day, sedation medication would be decreased. The next day, another medicine would be shut off completely. Then the ventilator and breathing tube came out. Then, we were down to just a nose tube. Soon, we were starting to bottle-feed him breast milk. First an ounce, then a little more. He had to be fed from a bottle so the doctors could measure exactly how much he was eating before being released from the hospital. The goal was to get as close to two ounces as possible. It was estimated that it would take at least two weeks for him to recover from surgery, and possibly more. But Jonas had other plans. 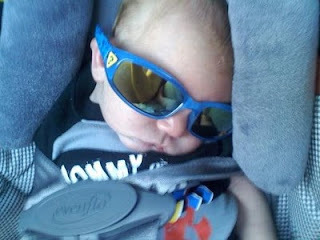 It was time to see the world, and just ten days after surgery, he was ready to do exactly that. Jonas was first on the roster for surgery, and we came in before sunrise to spend a little time with him before the team came to pick him up. When they arrived, we walked with them down the long hallways as they rolled Jonas's bassinet toward the operating room. We stood over him, kissed him goodbye, and tried to hold back tears until his bed was out of sight. Kris and I hugged each other as hard as we could, crying in the middle of the hospital hallway. We had been promised periodic updates as stages of the operation were completed, right down to the time they would be given. They came like clockwork, and with each update came a sigh of relief that everything was going well. Jonas's heart was in the hands of surgeon Dr. Redmond Burke, a charismatic and soft spoken man that put us at ease with his warmth immediately. We had been warned before we entered the room that Jonas's chest had been left open. The concern was that there would be fluid buildup in the chest cavity, so it was better to leave it open than to close it and have complications arise. We were both happy just to see our son, but remained mostly quiet as we stood by his bedside. These first few days were difficult, as Jonas was on so many medications, he was often sleeping or barely conscious. Kris took the photo below to show all of the machines our tiny little boy was hooked up to post-surgery. Surgery was over, but we still had many days to go before we could even begin to think of taking our son home for the first time. We arrived at Miami Children's Hospital on Monday morning, not quite sure what to expect. We met nurses, doctors, and loads of other people that were extremely kind and informative. Jonas's condition was explained to us once again, but I was so numb that most of it went right through me. 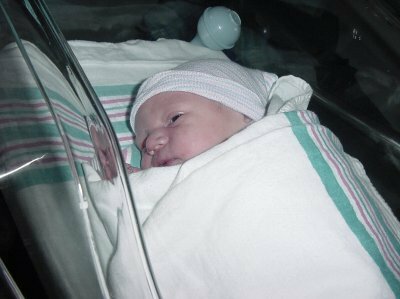 Our family circled around Jonas's bassinet, taking turns standing next to him, talking and singing to him, stroking his soft skin. I stood next to him, in disbelief that just the day before I'd held him in my arms...and thought he was a perfectly healthy baby. Now I gingerly moved tubes and wires, searching for places that I could caress and comfort him. I wanted to take a million pictures, I wanted to share his beautiful face with the world. 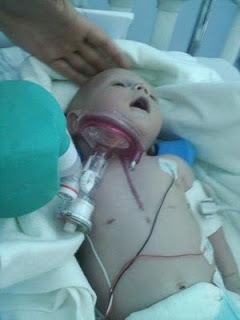 But his beautiful face was obstructed by a ventilator to assist his breathing. I had waited for so long to see him, and now he laid before me, hooked up to machines and pumped full of so many different medications just to sustain his life. I was overwhelmed, sad, scared, and tired. Those first few days before surgery, I carried with me the constant fear that he was not going to live. Admitting that here, in writing, is one of the hardest things I've ever done. I battled with giving Kris an ample amount of space to process what was happening, and getting the comfort from him that I needed. I ignored almost every text and phone call that flooded my phone. I couldn't respond without the wave of emotion washing over me, and leaving me with a lump in my throat and tears filling my eyes all over again. When we first arrived at MCH, we were assured that Jonas would wait no longer than two days to have surgery. When other babies were scheduled before him, it made me upset, until it was explained to me that their health was even more poor than Jonas's, and surgery was more of an emergency for those babies. I tried to take it as a positive sign, that he was as well as he could be for what he was going through. Kris works every Sunday. Even though Jonas and I were still in the hospital, Kris had already missed one day of work, so he decided it was the best decision for us financially. We kissed each other goodbye at 7:00a.m., and the baby boy and I began our day. I spent the next hour or so dozing off, cradling him in my arms. 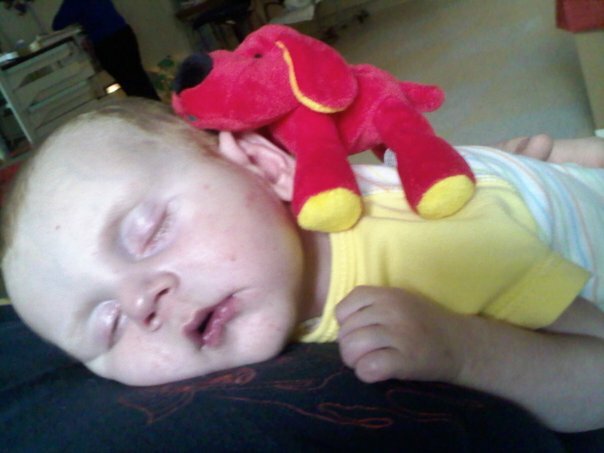 Around 8:00, a nurse came to take him to the nursery for one more round of check-ups. I bode my time checking facebook, watching the morning news, and sending Kris text message updates. A doctor came in around 8:45, stating that Jonas looked a little ashen, blue even. He told me Jonas would be transferred to NICU, and put under an oxygen hood to "see if he would perk up a little bit". I hadn't noticed anything wrong, and the doctor assured me it was probably just an infection that many mothers have and pass to their babies during delivery. Hours went by, and I struggled with whether to ask Kris to leave work. It could be such a minor thing, and I didn't want to overreact. Kris decided it was best to just come back to the hospital. I called NICU to get an update, and a nurse told me they were going to check Jonas's heart. I didn't think much of it. If something was wrong, wouldn't it have been caught on the ultrasounds during my pregnancy? Kris finally arrived at the hospital, and NICU asked us to come up and speak with the cardiologist. That's when I knew something was seriously wrong. My own heart sank to the floor. Kris tried to reassure me that it was probably no big deal. But I knew that if the cardiologist wanted to speak with us directly, something was wrong with Jonas's heart. We scrubbed up to enter NICU, and there was Jonas, laying under an oxygen hood. His tiny chest was rising up and down so rapidly, and he did indeed look pretty blue. I stroked his arm and leg, and talked with him while we waited to speak with cardiology. She began by telling us that Broward General was not equipped to handle Jonas's condition. It was called Hypoplastic Left Heart Syndrome. It is a rare congenital heart defect that basically means he was born without a left ventricle. The symptoms are often not seen until 24 hours after birth. Kris and I were floored. We both broke down in tears as she explained everything, drawing out a diagram, handing us paperwork detailing his condition, and answering our questions. We held onto each other as tightly as we could, then asked to see Jonas again. We cried long and hard, staring at our beautiful little boy as they hooked him up to a ventilator to support his breathing. We talked about what it would be like for him, for us, and hugged and cried some more. We decided to take lots of photos, even as I cried through each of them. We wanted to document all of this experience, no matter how painful, so we could show our son when he got older exactly what he went through. In this one, you can see me wiping tears away and Kris manages to still be the proud daddy that he is. We talked to our son gently, explaining to him that he'd be taking a helicopter ride to Miami Children's Hospital. We told him that most people don't ever get to ride in a helicopter, and daddy said he was jealous. We knew he couldn't understand what we were telling him, but it felt better just the same. LifeFlight came and introduced themselves, and we sat and looked on while they got Jonas all packed up for his flight. Around 6:00 in the evening, our families stood by the window to my hospital room, and watched Jonas's helicopter take off for Miami. The hospital room we paid for came with a fancy dinner with white tablecloth service, and so I tried to focus on eating and taking care of myself to be strong for Jonas. I had rack of lamb, lobster stuffed baked potato, something else that escapes my memory, and cheesecake. It was actually really tasty for hospital food. I was discharged early, and we went home to gather up clothing and toiletries to take to Miami. We decided to sleep at home, not knowing how long it would be before we could do so again. We talked a little, and I curled up with the boppy pillow, staring at the photo of Jonas's face on my cell phone as I cried myself to sleep. We settled into the recovery room, taking time with both sets of our parents, and enjoying Jonas. Friends came and went, bringing balloons and well wishes. The day went by really fast, and before long it was 11:00p.m. and we decided to settle in for our first night with Jonas. Kris had a pullout bed next to mine, with the bassinet between us. We laid the baby down, and started to fall asleep to the television. Then, it started. Hiccups! This may sound silly now, but night one as a mom and I didn't know what to do when a baby got the hiccups. Kris knew it was fine, but I still sent him out to the nurse's desk to be sure. Of course, you don't do anything when a baby has hiccups, so we had a good laugh over it and went to sleep. An hour or so later, Jonas was awake and hungry. He still hadn't learned to latch properly, so the nurse suggested about 10 cc's of formula, just to make sure he was getting some form of nutrition. We changed his diaper and went back to sleep. Around 3a.m., a nurse came in to check my vitals and make sure I was doing well post-labor. This was about an hour after they had woken me up to try breastfeeding, and by now I was exhausted and completely unhappy that they couldn't have just checked my vitals when they woke me up the last time! The nurse attempted to draw blood. Not once, but twice she failed to thread the needle to my vein. Sleep deprived and irritated with her lack of one of the most basic skills a nurse should have, I yelled at her to stop. She wasn't going to stick me a third time. She told me I didn't have to be afraid of getting my blood drawn, which infuriated me. I have never had a fear of needles, or having my blood drawn. But I do take serious issue with someone that doesn't know how to do their job right the first two times. I yelled at her to get out, and not to come back until she brought someone that could do the job right. A more experienced nurse came back, got it right on the first try, and I went back to sleep. A couple more hours of sleep, and morning came. I went to the hospital on August 6th, for a check-up. My due date was first the 8th, then pushed back to the 5th, so the doctor wanted to check and make sure I was healthy and so was Jonas. I was admitted for half a day, then sent home. They scheduled me to come back the next day and induce labor. Some women are adamantly against this, but there were concerns about his size and the health risks, as I had gestational diabetes. 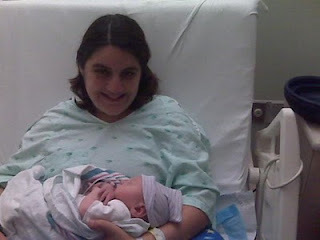 On August 7th, I came in at 8:00a.m., and Pitocin (medicine given to induce labor) was started at noon, on the dot. I was under the (very wrong) assumption that it wouldn't take more than a few hours to take effect. Ha! Kris and I hung out in our little room, passing time trading Rolling Stone and Bon Appetit magazine. We chatted, flipped through channels of boring daytime television, and updated our facebook statuses via cell phone. As the hours wore on, I grew increasingly cranky about not being able to eat, as they don't allow you food in case you need to be rushed in for an emergency c-section. Kris endured this the best he could, taking my mind off of it by making sure I had all of the orange popsicles a pregnant lady could wish for. I was taken for an ultrasound, to see how things were going and check his size. They estimated his size at well over 9lbs, and so began the talk of c-section. I was taken back to my room, and the doctor on duty came in to speak with us. 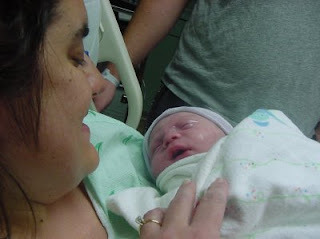 Kris and I were adamant that we did not want to have a c-section, unless Jonas or I were in serious danger. Evening came, and still no contractions. A new doctor was on duty now, and thought the previous doctor was ridiculous for suggesting an unnecessary c-section. THANK YOU! Around 8:00p.m., he came in once more for what I thought was going to be a regular exam. Instead, he sprung it on me: he was going to break my water. What a strange sensation that was. He and the nurse left, saying the anesthesiologist would be in shortly to administer the epidural. In the meantime, someone else needed an emergency c-section, tying up the anesthesiologist. The nurse suggested giving me a different shot to numb my discomfort, which at this point was starting to grow. I accepted. Shortly thereafter, around 9:30p.m., they came to give me the epidural anyway. I slept until midnight, leaving Kris to entertain himself with more crappy tv, as we'd already read our magazines cover to cover. Including the Ikea catalog. Haha. When I awakened, I could feel the contractions getting a little stronger. I squeezed Kris's hand as tightly as I could, asking him to help me focus on breathing, staying calm, anything to take my mind off of the discomfort I was feeling. I didn't want to get up, change positions, nothing. I just wanted Jonas to hurry up and get here. Somewhere during this time, we finally settled on a middle name. After much deliberation, we decided to honor the Engwalls by naming him Jonas Raymond. Raymond is my grandfather's first name, and my father's middle name. The Engwall family name ended with me, as there were no more boys in the family. We thought this would be a fitting way to pay tribute. Close to 3:00a.m, I was desperate to start pushing. The nurse wanted to grab the doctor, and have him present if I was to begin pushing. She took too long, according to my impatient laboring self, so I decided I would start pushing anyway. At 3:15, I looked at the clock above the bathroom door, and decided I was going to push for no longer than an hour. I had my mind made up that this is how it was going to be. And so we started. The epidural was not what I had imagined. I couldn't feel much of anything from the waist down, and yet I could still feel plenty of pain. It was enough to render me nearly ineffective at pushing, and after the nurse's several failed attempts at coaching me through it, she declared she would be turning my epidural medicine off and we were doing this without. Kris was absolutely amazing throughout this entire process. I had a nagging fear in the back of my mind that with my history of chronic leg pain from my car accident, I wouldn't be very good at this whole labor thing. Kris encouraged me, held me hand, made me focus, pushed my back forward. Held my knees closer to my chest. Ultimately, I think Kris did a fair amount of laboring, too! It was really difficult, and I did my share of complaining about not wanting to push for as long as the nurse was asking me to. But I didn't scream, I didn't curse, and and I didn't do the cliche telling off of the husband for getting me pregnant. So silly. Finally, after much anticipation, Jonas Raymond Hilburn made his way into the world at 4:25a.m. Just as I had told my body to do, I pushed for just over an hour. I had predicted months prior that he would be born in the 4:00a.m. hour, but the neatest part was 4/25 is my date of birth, and now Jonas's time of birth. They laid him on my chest, all warm and gooey and purple...just like you see in the movies...and I just kept saying "We did it little guy" over and over again. I searched for a dry spot on his head to stroke, and stared at him in amazement. I expected all this time that I would cry, but I didn't. I was in so much shock from labor, and my adrenaline was pumping. Kris cut the cord, and they swept him away to get checked out. 9 out of 10 Apgar score, (the wellness test they assess babies with upon birth) this kid was already passing life's first test with flying colors! They told us he was 7lbs, 6oz. and 19.5 inches. Perfect. The nurses cleaned him up, it was a bit of a blur right after. I was in awe and tired and amazed. My parents and Kris's came in to meet their first grand baby, all of them. We took lots of photos, again, much of this was a haze. I didn't even notice until months later that we didn't have the requisite first family photo. There are some me holding Jonas, with Kris standing next to the bed, but you can only see part of his t-shirt. It's almost funny, really. The grandparents left to let us rest, and Jonas was laid in his bassinet. They took him to the nursery for a more extensive check up, which was standard. I still hadn't eaten, so I asked the nurse for a snack, as it was too early for breakfast service. Graham crackers and juice seemed like a joke after nearly 48 hours without food, but I was so hungry it hardly mattered. Kris had long ago curled up in a chair for a nap, and I dozed in and out waiting for real food. Pancakes. Sweet, glorious pancakes! A nurse came in to move us from labor and delivery to recovery, and we moved on to the next phase of our new family life...blissfully unaware of the curveball that was to be thrown at us.